Like most of its droid siblings, the Motorola RAZR MAXX comes with a rich set of organizer features and Moto even threw in a version of Quickoffice that can edit documents too (on many phones, this is a paid upgrade). Quickoffice is an excellent app that has support for viewing several file types - Word, Excel, PowerPoint and PDF. It can also edit and create new .DOC, .XLS and .PPT files (2003, 2007 and 2010 versions are supported). You have plenty of formatting options, inserting images, Excel formulas and so on. The printing functionality enabled by MotoPrint is integrated into Quickoffice, which brings the document handling experience quite close to desktop standards. The calendar has four different types of view - agenda, daily, weekly and monthly. You can use the phone calendars or one of your online calendars to schedule events. You can also set multiple alarms to act as a reminder. The calendar integrates with the status bar and also offers pop-up notifications. The calculator is nicely touch optimized - the buttons are big enough and easy to hit. The RAZR MAXX features a standard-looking Alarms & timer app. You can set multiple alarms with different repeat times and alarm tones. The app does have an extra over the stock Clock app - a second tab with a timer. There's no stopwatch though. The old app offered cool custom watch faces here, but this one doesn't. There's a file manager on board as well - it can browse both the internal 16GB of memory and the microSD card. Batch actions are supported and you can ZIP (with or without encryption) and unzip archived files. It's a bit annoying that you can't browse an archive, just unzip it. Anyway, there's support for browsing shared folders on the Wi-Fi network you're connected to and also explore computers running MotoCast. Evernote also comes preinstalled - a popular note taking tool that synchronizes your notes across various platforms. 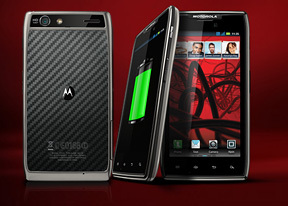 The app is free at the Android Play Store, but adding it shows just how much the Motorola RAZR MAXX is targeted at business users. Finally, there's a really clever app called Smart Actions. It lets you create automatic actions triggered by different conditions you set. You can have the phone do various things (e.g. disable background sync, change screen brightness, display a notification to remind you of something, etc.). There are several sample actions that can be useful in certain scenarios but you can create your own from scratch too. It's not quite like having NFC, which lets you automate such things with tags. This could be a bit more flexible at times but isn't a replacement for NFC, which has other functions too. The Motorola RAZR MAXX comes with a GPS receiver, which took about a minute and a half to get satellite lock upon a cold start. You can use the A-GPS functionality to get near instantaneous locks. Alternatively, network positioning will do if you only need a rough idea of your location. Google Maps uses vector maps, which are very data efficient. The latest version has an easy to use interface for caching maps - you just choose "Make available offline from the menu" and pan/zoom around until the desired area is in view (there's an indicator showing how much storage caching that area will take). You can later view cached areas and delete ones you no longer need. Note that there's a limit to the size of the area you can cache - you can't just make all of Europe available offline, not even a whole country. We managed to fit New York and some surrounding area before Maps told us the area is too big. Also, there's no address search in the cached maps and you can only cache map data in supported regions of the world. You can plan routes, search for nearby POIs and go into the always cool Street View. The app will reroute you if you get off course, even without a data connection. Now that the Motorola RAZR MAXX is running Android 4.0.4 Ice Cream Sandwich, it has access to the latest apps (like Chrome) and, with nearly 4GB worth of install space, you can download all the apps you want. The Store is organized in a few scrollable tabs - categories, featured, top paid, top free, top grossing, top new paid, top new free and trending. The in-app section is very informative - a description, latest changes, number of downloads and comments with rating. There is usually a demo video and several screenshots for most apps too. There are all kinds of apps in the Google Play Store and the most important ones are covered (file managers, navigation apps, document readers etc. ).